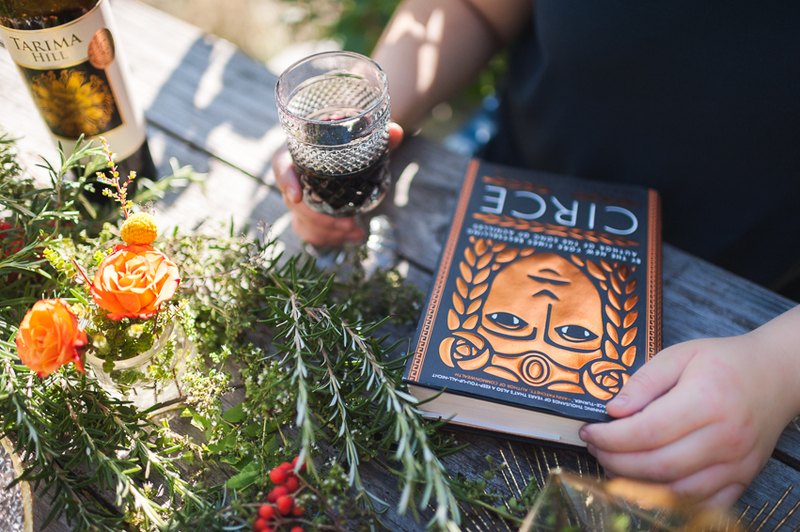 We honestly feel like we chose the perfect buddy read to take us into fall when we picked up Circe by Madeline Miller. 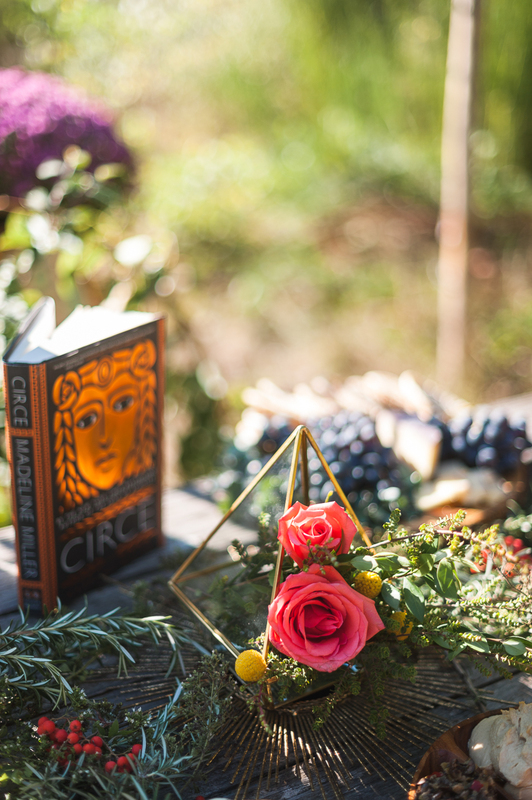 This retelling of Greek myth takes us with our heroine Circe to an island full of wild herbs, carefully tended gardens and forests bursting with flora. 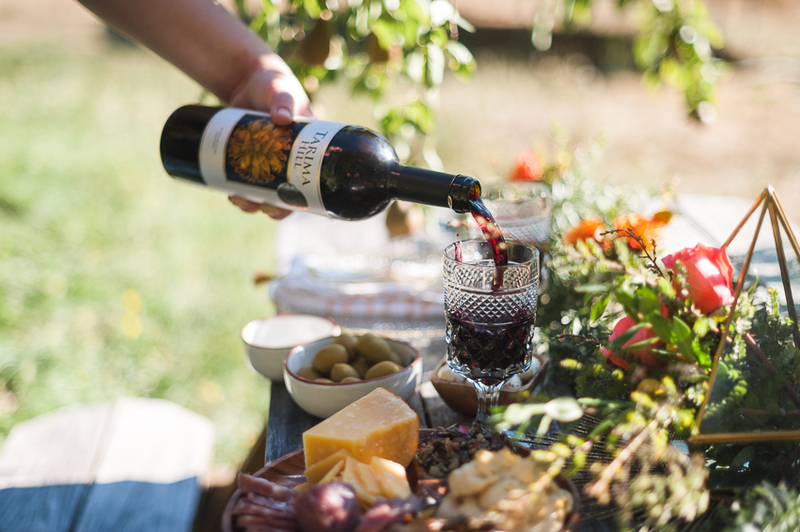 To honor her island of Aiaia we set up a simple picnic table out in the sunshine underneath a pear tree, against a backdrop of woods, so we could have lunch and soak up the mild afternoon while we talked about the novel. Layers of freshly cut rosemary were studded with the first of the fall berries, and a few fresh blooms were tucked into the fragrant, spiky riot. 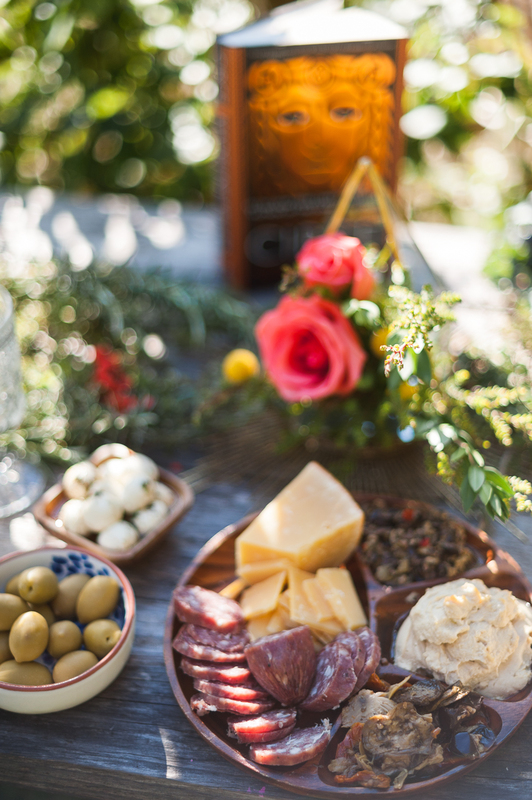 We love that the rosemary looks a little prickly, but smells so good, especially when it was all piled on the tabletop. Plus, it’s an herb used since ancient times by the Greeks, and seemed the perfect choice to represent the facets of Circe; a little prickly, a little sweet, and quietly powerful. We primarily used roses for our flowers, both in our tiny bud vases and in the centerpiece, because they were mentioned repeatedly, and because their orangey blush color really suited our early fall color palette. The centerpiece was a glass terrarium stuffed with a spray of cut greenery and roses all set atop a sunburst mirror to reflect (hah!) Circe’s father, Helios. Plates were cut crystal with dipped gold rims, and we finished our place settings with crystal goblets and gold napkins and cutlery. We wanted an opulent, mystical, ancient, natural feel all wrapped up together, and mixing our elements this way worked out really well. It ended up feeling understated, but gilded, just like Circe herself. Once the table was set, the laden boughs of the pear tree arched perfectly over our simple place settings, and all that was left was to bring out the food. 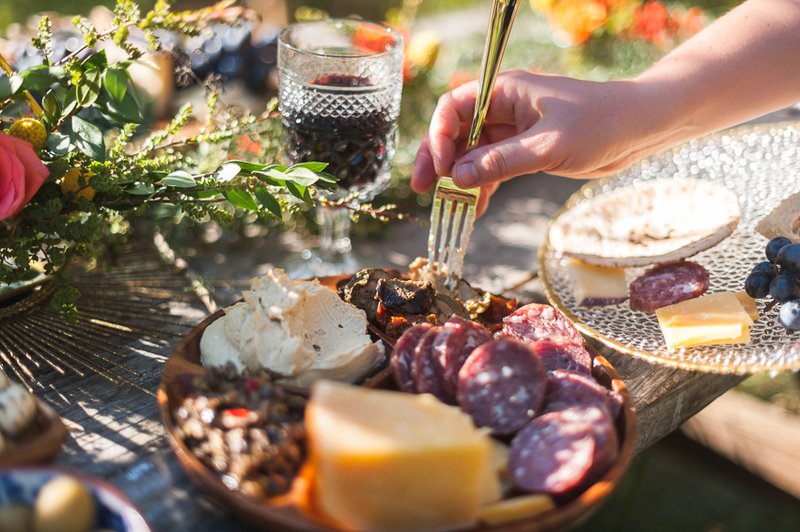 Sticking to a mediterranean flavor profile, we designed a charcuterie board piled with hummus, marinated vegetables, dishes of olives, flatbreads, grapes, meats, hard cheeses, and creamy balls of fresh mozzarella. 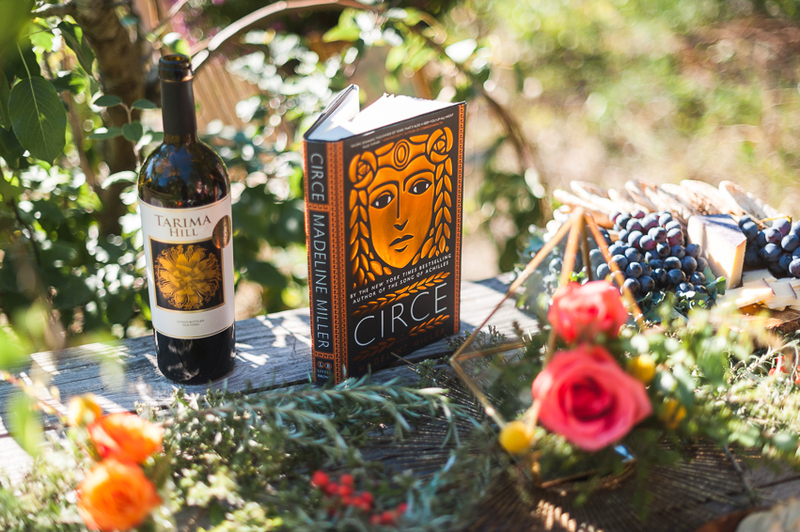 In the novel, Circe sets up long tables in her house and serves similar fare to visiting sailors, with plenty of wine, of course. Capturing that atmosphere with the food at our own long wooden table felt so right. Settling in with an array of snacks and goblets full of wine to discuss the book was the best part, of course (it always is!). We easily spend an hour trading insights, picking apart scenes, and weighing outside criticisms with our own opinions when we talk books. Part of how we prepare our discussions is to pay attention to other reviews to see what other people are generally saying about the novel, and then deciding what we agree and disagree with. 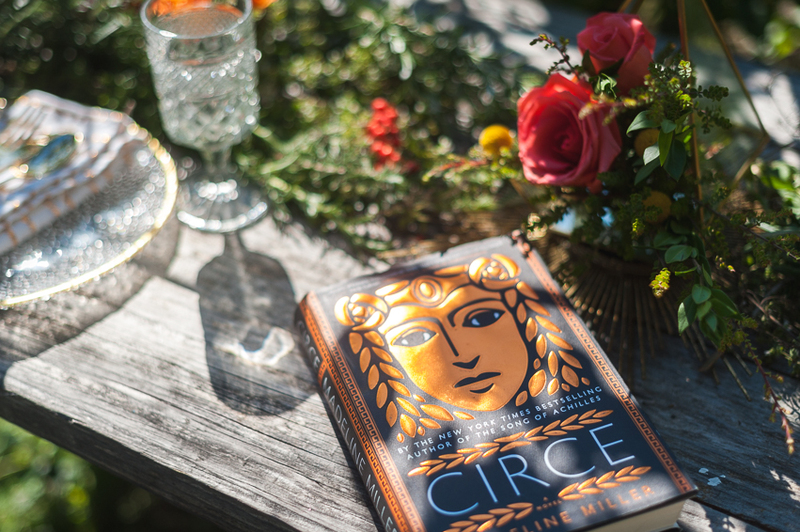 With Circe, one of the biggest criticisms we saw was that the novel lacked any “fireworks” from Circe herself, that she didn’t adequately own and display her powers to any real effect. We both disagree. Circe used her powers to defy the gods quietly, and to only please herself. Some elaborate action scene would feel untrue to the character Miller built for us, since Circe is very strong, but intentionally not flashy. What did you think? With the afternoon wearing on, it was eventually time to wrap it up and exit the dreamy space we had built and enjoyed for the past few hours. These little private book clubs are always worth the extra effort. Existing in such an atmospheric space while we hold our book discussions really lets us live the books in a way nothing else does. Until next time, friends! 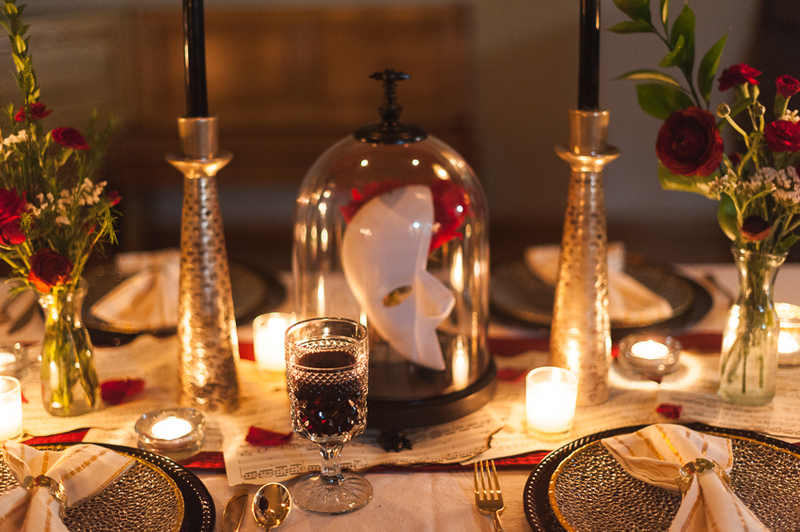 Fun fact: we thrift almost everything for our literary dinner parties. Actually, a combination of thrifting and a bit of scouring the clearance sections at HomeGoods and Target is probably more accurate. We do this as a hobby, friends— so our budget for these things is basically non-existent. I think the most we've ever spent for one dinner (excluding food/flower costs) is about $30, but we generally stay under $10. We've always tried to emphasize that these dinners are doable for anyone, and since we've covered the basic how-to's, we decided to share a little more about how we source our decor. Thrifted creamer jug, silver platter, egg basket, lace runner, and cans. Teacups are thrifted and clearance Anthropologie. Thrifted platters and milk bottle vases. Crackled pot is clearance Anthropologie, napkins, rose gold bottle, and marble candleholder are from Target clearance. Thrifted brass candlestick, votive holder, and jar. Drink glasses, and rose gold bottle are clearance Target. Napkins are from clearance HomeGoods. The first step, honestly, is to have a vision, or at least some kind of aesthetic feel that you want to create. We generally use Pinterest to do this! Next, round up everything you already have that fits your vision, and identify where the gaps are. Maybe you need a serving tray, or candle holders, or napkins. Whatever it is, keep those items in mind when you go to the store. Thrifted vintage china and books. Candle holder with flowers is clearance Anthropologie, marble candle holder is clearance Target. Thrifted vases, sheet music, red table runner. Plates, napkins, clear candlesticks are clearance HomeGoods, tall gold candlesticks are clearance Anthropologie, and the napkin rings and cloche are Halloween clearance from Target. Thrifted sheet music, red table runner, vases, and goblets. Now here's the tricky part: try not to get overwhelmed by the sheer amount of stuff in the store. When I walk in, I try to really focus on finding those couple things I need first and foremost. Sometimes it's glassware, or a table runner I need to complete the scene in my head, but I also have my eyes open for items that fit the aesthetic I want, and if I come across something, then I think about how I want to incorporate it. Also, whenever I find an item I'm interested in, I ask myself "but what else will I do with this?" If it's just too specific to one dinner, and costs more than a dollar or two, I have a hard time purchasing it...because then what? I store it indefinitely? I toss or donate it? It feels like a waste. I make a point to prioritize items: if I think it's going to completely make the set up, I go for it, but if it's just an accent and it's really too specific, I pass. Heirloom lace table runner and thrifted silver candelabra, goblets. Napkins and rings from Target clearance. Some trips are more successful than others, and that's okay. I prefer to think of the whole process as a treasure hunt instead of something stressful, and it's okay if I don't strike gold every time. One thing that does increase my success rate is looking at creative uses for things. Can that jar be a vase? Can that cool piece of lace be cut into a table runner? Can I put a pillar candle on that little plate? You have to think a little outside the box sometimes! It’s also worth noting that we plan for our next buddy read and dinner well in advance. As we're reading, we each take our own notes and develop a vision that we'll talk about and combine. If we had only a few days of planning and gathering materials, we would like be more stressed and would have a harder time including so many details. 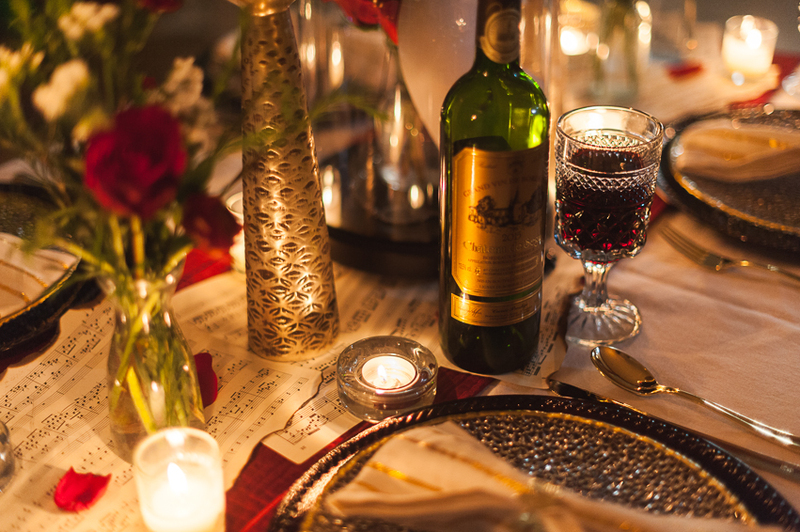 And really, the details are our favorite elements of a dinner party: the menu, drinks, and decor, we've found that they add a richness to the experience and aesthetic quality. Lastly, we really do compliment each other in setting up these dinners. From styling to small adjustments, photos, and food, we couldn't create what we do alone, at least not as wonderfully. Of course, that isn't to say you need a best friend to throw your own dinner party with, but it certainly helps! If you have any thoughts or questions, we’d love to hear! 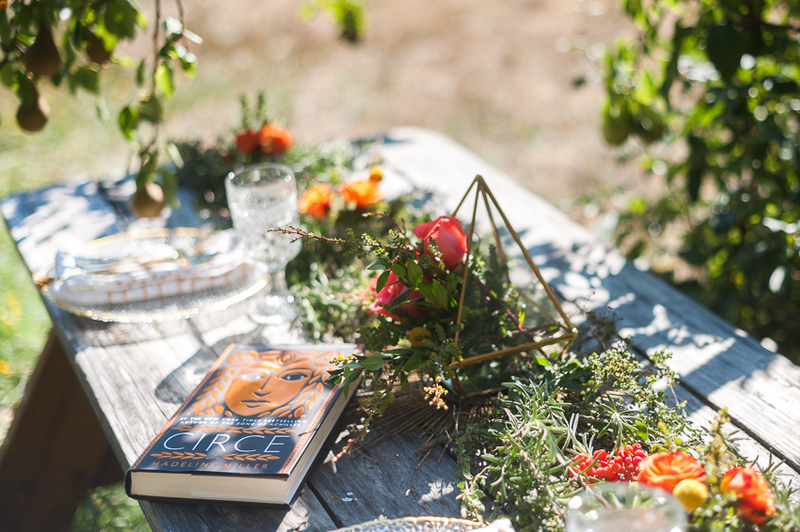 The days are finally starting to lengthen and the sun is peeking out from the clouds more often here in the PNW, so we decided to sneak in just one more winter feeling dinner party before we switch gears towards our spring reads! Phantom of the Opera was the perfect blend of the golden glamour and sinister horror as we stand on the precipice of the season. It's a short classic, only a little over 200 pages, was published in 1911, and we read the translation by David Coward. More about the importance of translations here! Rikki had never seen any of the movies before, but I've seen the play twice and watched the movies countless times thanks to a high school obsession with it. I will say that while the plot of the movie and the book are similar, the movie is much more focused on the melodrama/romantic and the horror aspect is downplayed a bit. In the book the Phantom is much more evil, murderous, and just straight up insane. His backstory differs in the two versions as well, which was interesting. For this dinner, the theme was "gilded horror". We took the glittering opulence of the opera house and blended it with some darker elements to achieve that beautiful, sinister feel the book has. We've said it before and we'll say it again, we make the most of what we already own and purchased almost nothing. It's just a matter of eyeing what we have and blending them together to achieve the look and feel we're going for. Fresh flowers make a big impact, too! 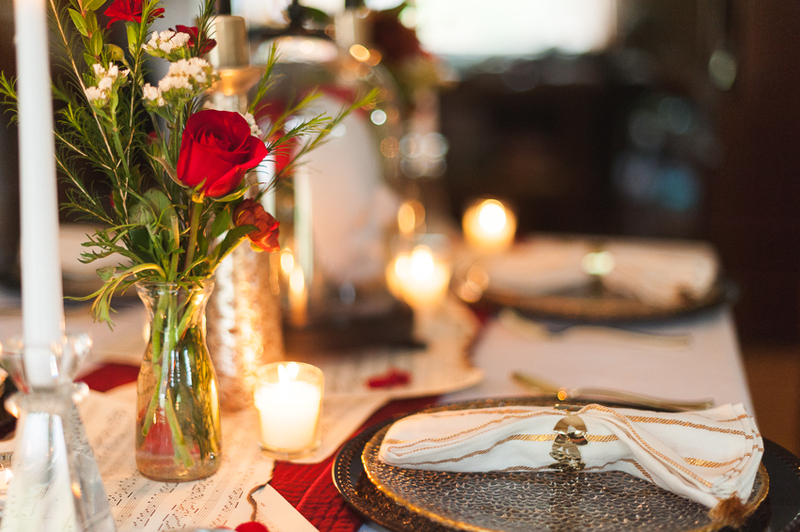 We started with a plain white table cloth, on which we set a deep red table runner (also seen in this dinner party!) and overlaid with music pages that I had spent the morning carefully burning the edges of over my sink. I only had to drop one into the basin and frantically blast it with water to put out the flames haha! It was just a thrifted music book I had picked up cheap, so I didn't mind tearing it apart and singeing it. On top of that, I dug out my black Halloween cloche and placed a Phantom mask I picked up at a craft store along with a little bud vase of red roses and a mirror necklace that belongs to Rikki's daughter. Flanking that we had two enormously tall black taper candles to give some height and drama, with smaller tapers and vases of roses falling away. 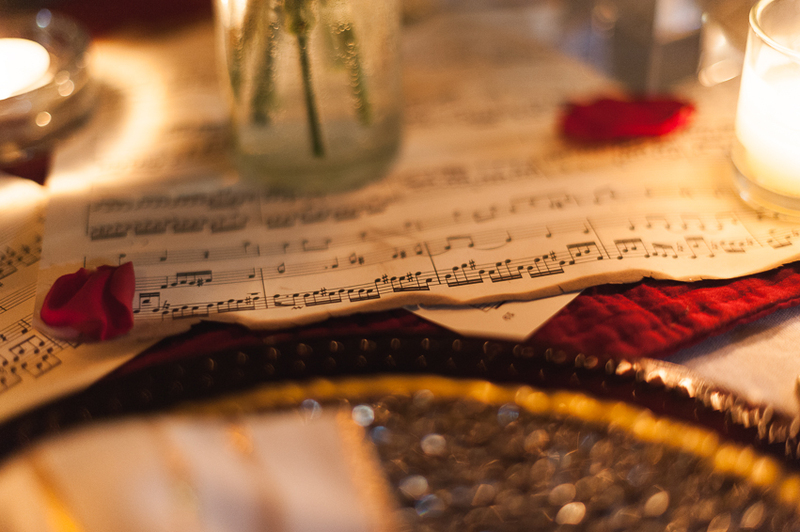 Glittery tea lights were scattered along with a few rose petals that fell during the flower arranging process. Our place settings were gold rimmed crystal plates set on black chargers; gold utensils and gold striped napkins in rings completed the tablescape. On the counter behind the table we set up basically a solid wall of candles flickering in the window, with some flower arrangements tucked in for color and texture. I imagined the ballroom in the opera house ablaze with candlelight and golden accents for this. I literally just went and pulled out every candlestick and holder I owned that was gold or crystal to achieve this, and set a hammered gold tray of drink supplies alongside a marble cheese tray for bread and cheese. Our copies of Phantom captured between my Eiffel Tower book ends lurked in the corner. 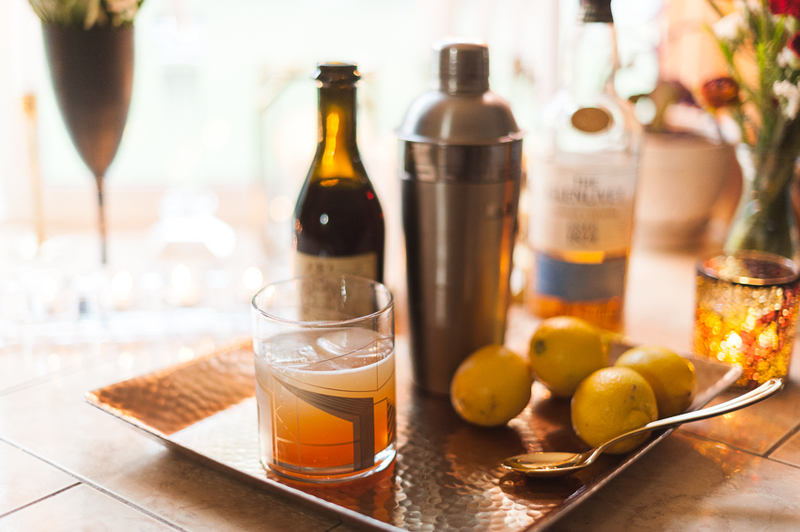 We were lucky to collaborate with So Many Damn Books for the drinks portion of this dinner. Chris and Drew host one of my favorite podcasts, where they interview authors while sipping on a drink they created that was inspired by the book they're discussing. If you haven't given them a listen, check them out! They were kind enough to send us a recipe they created called "The Mask" which was the perfect smooth, potent accompaniment to our appetizers. For dinner, we kept in mind that the book is set in turn of the century Paris, and opted to stay with ultra classic French food. We made coq au vin and herb roasted potatoes, which we naturally paired with French wine. Dessert was opera cake and macarons, because of course! Keeping the food simple and classic made the evening flow easily, and we talked and drank way past our bedtimes. 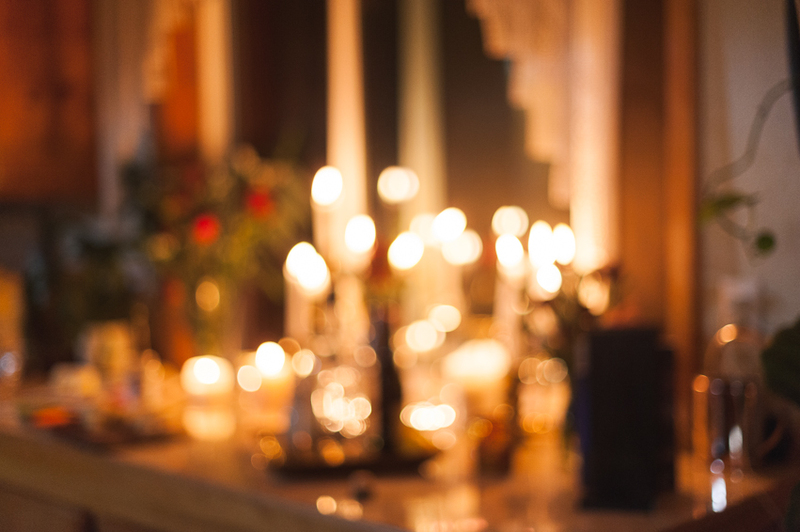 There's something so alluring about sitting around a beautifully set table with friends and bookish conversation, and it continues to be the main motivation behind throwing these literary dinner parties. We were so glad to close out our winter season with this dinner party, and are already planning our first spring dinner of the season in a couple of weeks! À la prochaine, mes amis!